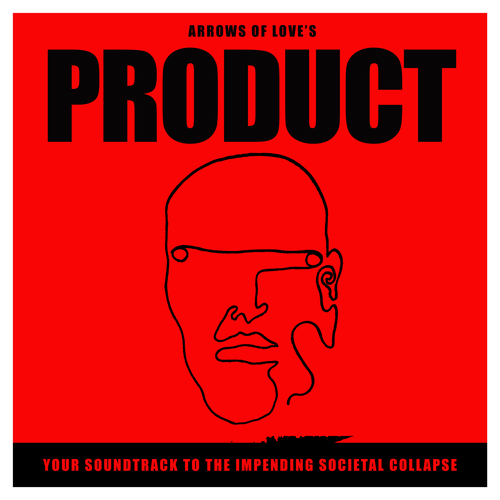 In January, East London art-rockers Arrows Of Love will release their eagerly anticipated second album, ‘PRODUCT’, an eleven-track masterpiece and an epic amalgamation of blisteringly heavy guitars and earnest, heartfelt lyrics. Here, the collective weave a world which is in equal parts aggressively powerful and vulnerable, where poetry meets pure punk attitude. The LP was produced by Mikko Gordon (Thom Yorke, Gaz Combes), in the studio he built himself at Goldsmiths University, and mastered by Bob Weston of Shellac. Lead track ‘Signal’ was also given a mix by celebrated engineer Margo Broom (Fat White Family). As with their acclaimed 2014 debut, ‘Everything’s Fucked’, the album is a striking and beautiful critique on modern life, politics, philosophy and the fight against apathy. ‘PRODUCT’ is a call to arms, even more so than previous outputs, one which has been forged over the years and created by circumstance. Arrows Of Love are, above all, a live phenomenon. Originally aligned with the early East London wave of bohemian rock bands, it was their fiercely independent and creative drive that has taken them across the globe, to the likes of SXSW and End of the Road, to sharing stages with the likes of The Fall, Buzzcocks, British Sea Power, 80’s Matchbox B-Line Disaster, The Wytches and many more. It’s on stage where London's own Arrows truly hit home. Drawing comparisons to the discordant, emotive musicianship of Sonic Youth to the raw power of McClusky, this second LP sees a band fully diversified, and truly unique. These mp3 tracks have been encoded with LAME providing you with a very rich listening experience. No DRM or copy protection is built in to the mp3s.